Lawn Gone! 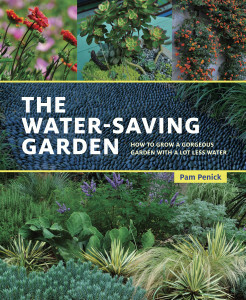 author Pam Penick has a new book out, The Water-Saving Garden, about – you guessed it – designing gorgeous, colorful landscapes that don’t rely on water to look good. Though I’ve read a couple of garden books on saving water in the past, none has done such a good job of addressing a wide variety of climates, with design ideas and planting suggestions that can be applied equally well across the country. 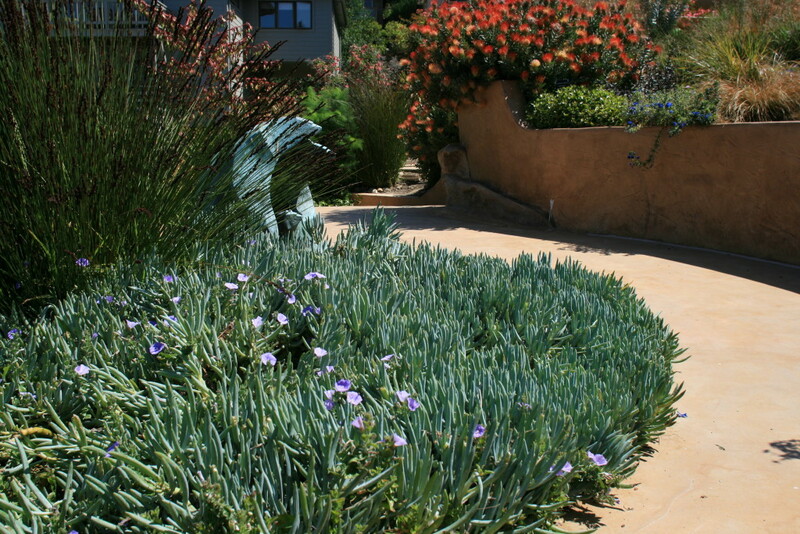 She starts with a garden tour showing all the beauty and ingenuity that can go into designing a drought tolerant garden, and how to adapt different design styles to suit the need for less water. Pam features the gravel garden at Chanticleer in Pennsylvania, a boldly colorful contemporary landscape in Arizona designed by garden great Steve Martino, a Zen courtyard in Oregon, and many more. She then shares practical tips for preserving the water that naturally comes onto your property, choosing plants that will be happy, and designing a landscape that doesn’t look xeric. I was particularly inspired by Pam’s ideas on how to evoke water in a dry landscape. While she shares photos and designer advice on using stone, sculpture, mirrors (brilliant! ), and water itself in this way, she also talks about using plants “to create an illusion of watery abundance”. As she points out, choosing dry-adapted plants to accomplish this sleight-of-hand makes the illusion even more satisfying. Because I’ve been into succulents lately, I wanted to focus on some of the ways these plants can be used to bring a feeling of lushness and water into a water-thrifty garden. “Mat-forming or creeping groundcovers with silver or blue foliage quickly fill in to create the illusion of a limpid pool or a light-reflecting lake, while covering bare soil or replacing swathes of lawn,” Pam says. This photo I snapped at the Wave Garden in the San Francisco Bay Area seems to illustrate her point, with a lush stand of blue chalksticks (Senecio serpens) following the curve of a pathway and looking a bit like a pool of flowing water. She also suggests John Creech stonecrop (Sedum spurium ‘John Creech’) with its green, scalloped leaves and haze of pink flowers in late summer as a colorful alternative. “Plants with an otherworldly form or fantastical foliage or color can create a magical underwater mood,” she says. 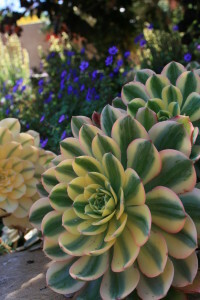 “Succulents are especially good for this, which is ironic because they are wonderfully water-thrifty plants.” She suggests using clamshell-shaped paddle plants (Kalanchoe luciae), agaves with writhing arms such as squid agave (Agave bracteosa), and crested euphorbia for undulating brain coral, among others. 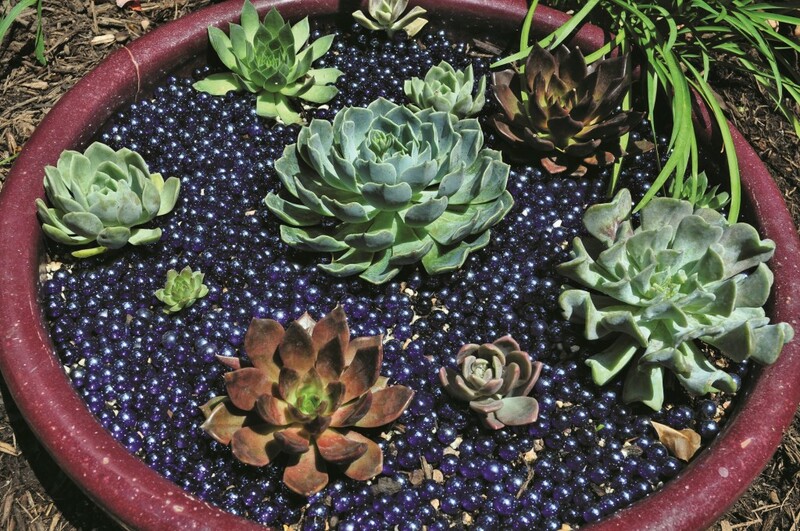 “You can also use succulents to create an ever blooming, waterless lily pond in a container or birdbath,” Pam says. In a dish planter, she suggests using a handful of dinner plate aeoniums with that flat, saucer-like shape that resembles lily pads, and a few dusty pink and blue-green echeverias to stand in as water lily flowers. Then mulch the “pond” with glass beads or blue frosted glass chips for a watery finishing touch. Of course, here in the Pacific Northwest, one barrier to using succulents is our ample rainfall in winter, which can cause root rot in even the sturdiest of specimens. Luckily, the solution is simple: pumice. 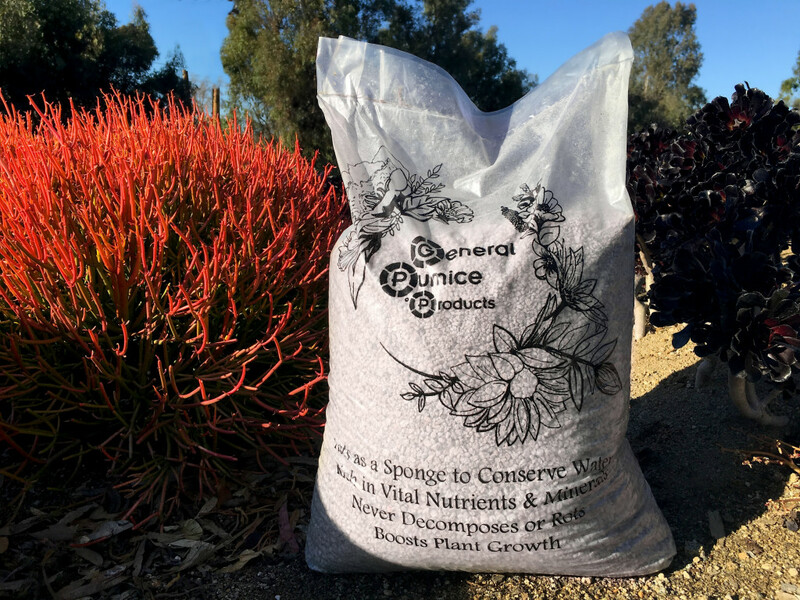 Pumice has a number of air pockets that soak up excess water and release it slowly as the soil dries, keeping succulents from rotting or drowning in the winter wet. Pumice is a lot heavier than perlite, so it doesn’t all float to the surface of the soil over time, and it contains a huge number of micronutrients that help your plants grow. To use pumice effectively with succulents, simply mix equal parts potting soil and pumice for your pots, or to create succulent planting areas in the garden bed, just mix your native soil with equal parts compost and pumice for an airy planting bed that your hardy succulents will love. You can also mulch with pumice to help soak up any excess water sitting on the surface. This make sure your succulents get the water they need, but it’s doled out at a rate that’s easier for them to use and deal with. Photo of the succulent dish garden reprinted with permission from The Water-Saving Garden, by Pam Penick, copyright © 2016, published by Ten Speed Press, an imprint of Penguin Random House LLC. Photographs copyright © 2016 by Pam Penick. Love to know how to save water! I ordered a bag of this stuff and it is great — could definitely use another so hope I win! I’ve been reading about general pumic & really would love to try it. I would love love love to try out your pumice products! Thanks for hosting this giveaway! This would really come in handy when I’m planting succulents. I got the book last week and just love it. Pam is an excellent author and her book is full of useful information and wonderful photos. I would love to have the pumice. I am putting in 3 circular succulent beds. Thanks for spreading the word about Pam’s new book. She is inspirational for those of us living and gardening in parched areas of the country. I follow her blog religiously. Thanks for being a “Digger,” Laura! I’m happy to be able to share gardening inspiration for those of us in more challenging climates. I’ve been interred in pumice since reading about it awhile ago and would be delighted to win these bags. Please count me in! Thank you for the pumice information for clay soils. I always find practical garden help from reading your blog although we are in different zones, you have helped me tremendously several times. So, thank you very much. Great book and thank you for the giveaway! I’d love to have an opportunity experiment with pumice in succulent plantings. Sounds like an awesome book and some really fun giveaways. Glad to find your blog! I am looking to improve the Heath of my succulents and love all of this great information! Thanks! I would love to win a bag of pumice for my succulents! I’m ordering this book and more pumice even if I don’t win!!! Hmmm, I haven’t yet heard about using pumice in the garden. All the more reason that I should win some…. Yes, please!! I’m in the beginning stages of designing a mini garden for myself. I’d looooove to win this! I’ve been using pumice in my potted succulents for the last 4 years. It’s the best. I love the pictures and look forward to reading the book. I teach a high school class and we are specializing in succulents and sedum this year. My succulents are my babies and I want to treat them with the very best (and water them as little as possible here in California). Thank goodness for our beautiful native pumice! Trading in my pearlite for pumice! What a great book party! Would love to win some pumice! I live by pumice in my gardening! It’s indispensable for my succulents, especially my Aloe collection. I go through bags of it. I mix it with a variety of other amendments depending upon the plant. It’s made all the difference in the success I’ve had with more “difficult” xeric plants. I also use it for starting Aloe seeds. Can’t wait to try this pumice!! ?????? Pumice is so hard to find in the Midwest, I’ll have to grab some next time I’m out west. Just received a bag I bought last week, will be trying it out on my opuntia cactus. Love the pumice! Even got the nursery I work for on Dallas, Texas to sell in our store! Wonderful product, has unlimited usage for the gardening world. Best product for soil aeration, much better than perlite. I loved the info and especially the water lily concept. I’ll have to pick up more pumice blend next time I’m at Waterwise Botanicals! ? Pam’s new book sounds like an exciting resource. I am a big fan of pumice in my potting medium for succulents and would love to win a bag. I like GPP pumice so much, that I’m always recommending it on every website and forum. Some people have accused me of being on your payroll. I look forward to adding pumice to my soil mixes! Pumice? I thought it was only for scrubbing feet! Bonus, in California! Never had the chance to use pumice in my plantings. Pick me, please. I am interested in learning more about about SIP, sub irrigation. Can you recommend an article, book, or website on this topic? Thanks for the pumice information! What a wonderful way to be able to grow succulents without drowning them. I would love to win some of this product. It sounds great. Thanks for the chance. Gen, I’m glad you enjoyed the concept of evoking water with creative plant choices! And yes, you illustrate the idea perfectly with that “pool” of senecio. Thank you for your thoughtful description of my book, and for hosting the book-release party and giveaway with me! I love reading the comments from people hoping to win, and I see that several are already big fans of the pumice from General Pumice Co. Yay! Just got my first bag of pumice and mixed up a new batch of planting mix…I like the fact the pumice stays where it is and not float to the top when watering. Anxious to see how the new planting take off. A few years ago, the Allen Centennial Gardens at the University of Wisconsin, Madison put in an ‘underwater’ succulent display. All around the stone bases that hold up their massive urns, blue beach glass had been spread with various weird and wacky succulents growing through. It was a wonderful display. I am always looking for way to save water in the garden. This book looks like one I need. AND I am glad there is something other than perlite to use to make succulent soil mix. I have the problem of the perlite floating to the top even when I put a layer of gravel as a decorative mulch on top of the soil. Pumice sounds perfect. This would work so well for my gardening family in Oregon. New to the West Coast I’m excited to learn about adding pumice and am looking forward to checking out Pam’s new book! Hadn’t realized the nutritional component pumice adds to a planting. Looking forward to trying it out in my next install. I use pumice with bonsai and seeing how well they are doing, started mixing it into every planting hole (along with compost). I definitely need more! Thanks for the give away. Love the idea of using blue glass to evoke water around a dish of succulents, definitely trying that this year! Love the ideas in this book. Can’t wait to read it in full. Love the give a ways. Thank! I’m thinking about putting in a hardy cactus garden in my yard in Buffalo NY.This would answer my problem with winter wet. Add me to your entries, please! I love succulents. Finding those that can handle our heat and occasional freezes is the challenge. Ghost plant seems to win every time. I’d love to try some of this in our garden!! I’m a sucker for succulents! Could do with that bag of pumice. All the best to Pam on her latest book. Enjoyed her Lawn Gone! very much. Beautiful photographs and lots of ideas–food for thought. Planting for purpose of saving water also saves time in the garden. The ‘climate’ in my region has seriously changed…moving from my beloved woodland plants and taking up agaves, aloes and aeoniums…with a sprinkle of cacti. I need pumice, everybody needs pumice! Saving water is everyone’s responsibility. My succulents and cactus will love me for adding this to their containers and my flower beds benefit as well! I’ll put them to good use. I’ve never tried pumice before! I am so glad Global Pumice Products are now in business – they have the best quality pumice around! I have used almost all of my 2 bags of pumice for succulents where my pool was filled in. I am also growing them in pots. I would love to have another bag. Oh hoping hoping hoping I win some of this magic potion?!!! Is it true that I can grow succulents up here? Ok your very first picture got me. What a beautiful way to have a water feature. I may have posted before, but forgot to include my info for the contest. Though I have to say I will be back. Would love to give the pumice a try! Please enter me in your giveaway! I first found your blog through your Fiskers tool reviews. Thank you! I keep resolving to eliminate all pots that aren’t low-water succulents, agave, or cacti. Of course, the moment I made this resolution, I suddenly acquired two citrus trees and a banana, but I am trying! Pumice would be great to make my own soil mixes. The cactus soil I find at the store is far too expensive! I took out my front lawn and I’m making plans to put in a succulent garden with drought tolerant plants. After these amazing rains I have some work to do with the clay soil! Thank you for the inspiration and information. I look forward to reading Pam’s new book. I’ve been adding more and more native plants to my Texas garden every year, but I haven’t collected many succulents…yet. I have several on my wishlist this year to add to my water-wise garden. I cannot wait to read Pam’s book and this is such a great giveaway…we have a similar winter problem here in the NE so this product looks great. Dying to try out this pumice! Yah, pumice!! Great blog too. I’m not gonna get anything done today now. I have never used pumice in my yard but its worth a shot! Can’t wait to give pumice a try! So pumice helps plants thrive? Count me in! Thanks so much for the opportunity to learn about it, and for the book giveaway too. Blessings, and to a lovely early Spring…..
Would love some pumice for my new backyard garden! My succies love it! We don’t have much time to water our plants at the office and have implemented those ideas for pot plants. We have quite a lot of succulents, such as Kalanchoe luciae and Agave bracteosa, that make the office look greener, give a feeling of water, as described above and need little care. With El Nino not really delivering the water we need here in California, we need all the water saving tips we can get!